On this page, you will find all there is to know about the Software updates for Pokémon Sun and Moon (originally released on November 18th in Japan, North America, and Australia, and November 23rd in Europe). Looking for Software updates for Pokémon Ultra Sun and Ultra Moon? It’s this way > click here! 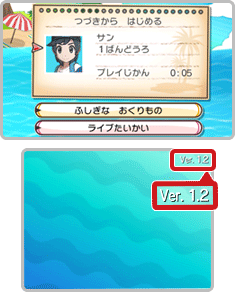 To check that you have the latest version of Pokémon Sun and/or Pokémon Moon, simply launch the game: you should see the version number on the main screen, in the top right corner of the bottom screen (Ver. 1.2 in that case). Additional Notes: once this update has been installed, any Battle Videos saved prior to this cannot be played or shared. Also, you need to install it to keep using the online features of the game. Notes: this update fixes the issue with the Rocky Helmet item and the Memento and Parting Shot moves (click here for more details), but also the one where a Pokémon would not learn a move when evolving when it should do so. You need to update in order to use the online features of the game. Also, recordings made with Ver. 1.0 are not compatible with Ver. 1.1 of the game.